"On the Windows Phone Developer Podcast, a plethora of new features were announced that will really bring Windows Phone up to par with the competition..."
I wouldn't consider things settled yet, but there's some real nice additional functionality that's coming our way with the Mango update. Along with real GPS navigation, we're going to get Bing Audio and Bing Vision, as well as Voice to Text SMS. How much of this will actually make it to all markets is still an open question, since Marketplace hasn't been fully rolled out either. 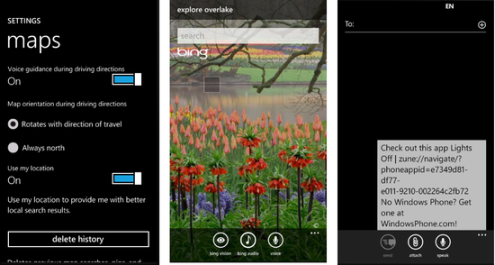 But its encouraging to see the progress Microsoft is making towards a truly competitive mobile OS. I would not feel bad at all if instead of music recognition the team delivered a good voice command experience. GPS navigation is a welcome addition. I hope that Mango will bring all, or at least most, of the features that I had on my HD2 with WM 6.5. While turn by turn is a nice app to have a "usable" calendar, tasks, categories and desktop sync are vital functionalities for a smartphone in 2011. I do wish that MS would bring all the functionality of WM back to WP with all the improvements that it made. I would like to see video MMS, or anything similar that would allow users to share video.